WE HAVE A WHOLE PARK OF IDEAS. The Presidential Pool Park gives you the opportunity to see a variety of full-sized pool design and water feature options in person. There is no better way to determine what you like, what you want, and what will work best in your dream backyard. At 18,297 square feet, your tour of the Presidential Pool Park will leave you with thousands of ideas for your backyard. Anything you have wanted to compare is there. You will find rock walls, rock speakers, caves, slides, fireplaces and fire pits. The pool park is fully landscaped, allowing you to also evaluate travertine deck, multiple types of flagstone, sealed sand, Marbella stone, and pavers. And with 6 fully functional pools and over a dozen water features, you can determine how best to build your dream backyard. Join us Saturdays from 9 a.m. until 11 a.m. for free lunch, pool parks, and much more during our Presidential Pool Park BBQs. 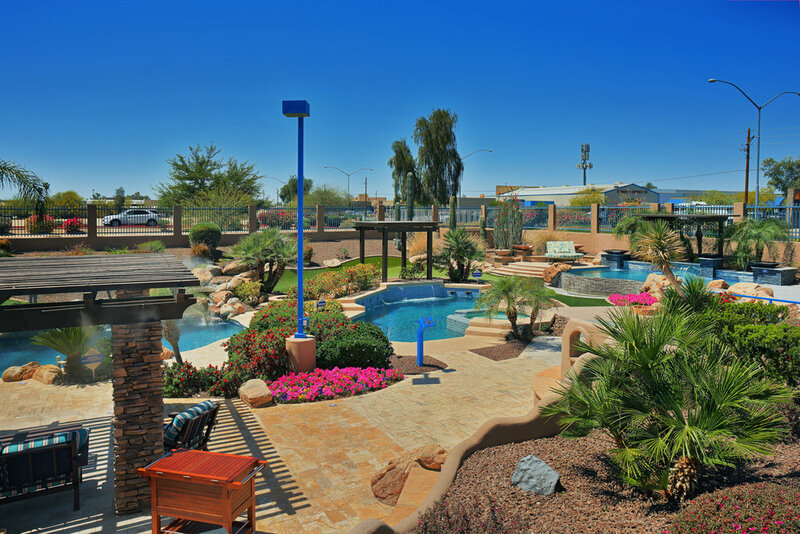 The Presidential Pool Park is located at Presidential Pools, Spas & Patio's corporate office in Gilbert. We invite you to visit us weekdays between 8 a.m. and 5 p.m., or on Saturdays between 9 a.m. and 5 p.m. We are closed on Sundays. We welcome you to visit us soon!